Catching beautiful fireworks performs is indispensable things on New Year’s Eve, which is as old as the Earth. Every Lunar New Year, Hanoi welcomes the huge volumes of Western tourists visiting the capital to taste the difference of Tet in Asia country. Now we’re getting closer to 2019, let Hanoi Local Tour has picked a few popular spots for your stunning Hanoi Tours that’ll surely provide tourists the panoramic views of the evening’s festivities without straining your wallet too. 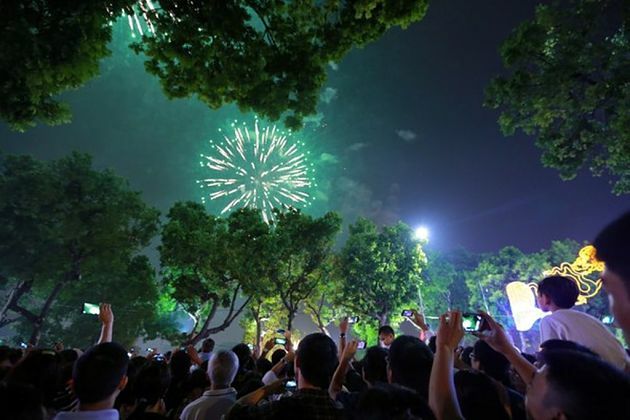 Fireworks will light up the Hanoi sky to welcome the Lunar New Year, and as planning in advance, the local authority of Hanoi Capital will allow more than 30 spots to shoot fireworks both the high-altitude and low-altitude fireworks on New Year’s Eve 2019 within 15 minutes. Explore and find where to see fireworks near you! In the Lunar New Year’s Eve 2019, Hanoians can enjoy the eye-catching fireworks, and according to planning, there are more than 30 places allowed to perform fireworks on this occasion. However, in comparison with the last year, this year has operated 6 shooting fireworks spots which show both the high-range and low-range fireworks and 3 fire-bending spots (shoot fireworks without bang). 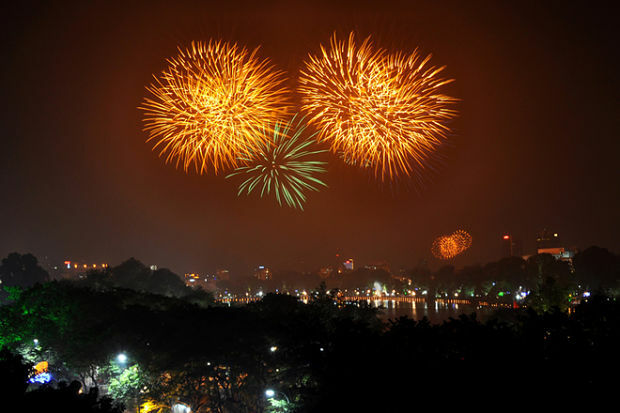 Where To See High-Altitude Fireworks in Hanoi? 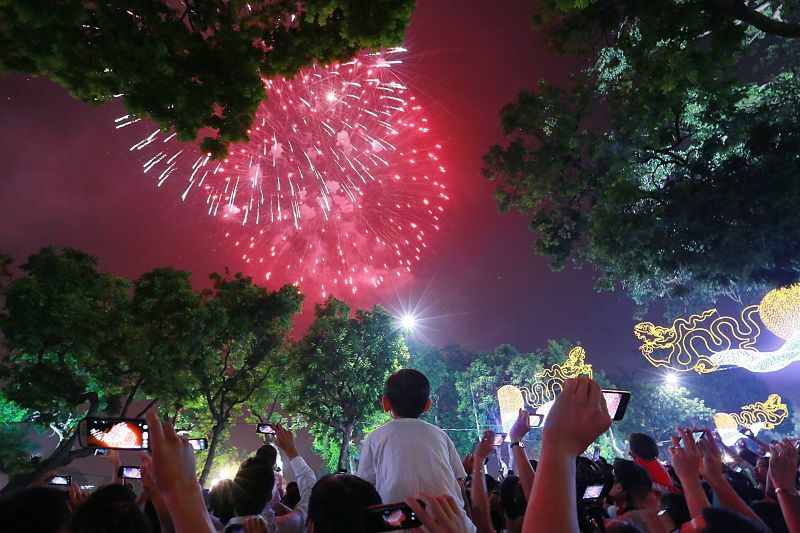 The high-altitude fireworks will be shown at five venues in the capital, which consist of Hoan Kiem Lake, Thong Nhat Park in Hai Ba Trung District, Lac Long Quan Flower Garden in Tay Ho, Van Quan Lake in Ha Dong, and My Dinh stadium in Nam Tu Liem. These specific spots have been decided by the local authorities, and there will surely attract a lot of visitors coming here to share the last moments and also welcome new year together. What About Low-Altitude Fireworks in Hanoi? The low-altitude fireworks will be performed in the 25 places in districts of Dong Da, Ba Dinh, Thanh Xuan, Bac Tu Liem, Cau Giay, Hoang Mai, Thanh Tri, Long Bien, Gia Lam, Dong Anh, Soc Son, Me Linh, Ba Vi, Phuc Tho, Dan Phuong, Hoai Duc, Thanh Oai, Quoc Oai, Ung Hoa, Chuong My, Thuong Tin, Phu Xuyen, My Duc, Phu Yen, and Thach That. Although these places stay far from city center but instead, you can easily delve into the stunning fireworks and don’t have to shove. Moreover, services available in here are much cheaper than those in the center. Let’s find a suitable spot to enjoy New Year’s Eve 2019 fireworks!